Dr Abas Hadawey is a senior lecturer in School of Engineering, with BSc, MSc and PhD in Mechanical Engineering. To strengthen and extend his teaching experience and to develop his research skills, Dr Hadawey completed a postgraduate programme in teaching and research (PgCHEP). 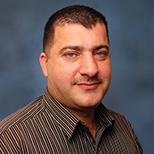 Dr Hadawey is currently the course director of MSc Mechanical Engineering. During his career, Dr Hadawey worked on a number of projects including design of standalone chilled food display cabinets for better performance and less energy consumption, tri-generation in the food industry, minimisation of emission from food retailing, application of PCM in low and medium temperature food product application for energy and CO2 emissions reduction. In addition, Dr Hadawey is currently researching the impact of integrating technology in the teaching process. The aim of this project was to implement a technology in the teaching process, in order to create an environment that encourages students to participate in a module outside the classroom, and to improve students’ engagement or time spent on learning to achieve a better learning performance. Dr Hadawey has over 15 years of experience in the Higher Education sector and is currently working at LSBU as a senior lecturer and course director for MSc Mechanical Engineering Course. Formal model based methodologies for the design of standalone chilled food display cabinets (2001-2006). Tri-generation in the Food industry (2003-2007). Low temperature absorption refrigeration systems (2004-2007). CO2 emission of retailing food products (2007-2009). Integration of CO2 refrigeration and tri-generation systems for supermarket applications (2006-2010). Energy savings through liquid pressure amplification in refrigeration systems (2008-2009). Application of PCM in low and medium temperature food product application for energy and CO2 emissions reduction (2010-2012). District Heating Development and Energy awareness buy-in (2013-2016). The impact of technology integrated teaching on the students’ learning (2016-2018). Hadawey, A Numerical Investigation into the Product’s Weight loss and Display Shelf life inside the Serve-over Cabinet. In: 2nd International Conference on Sustainable Energy and Resource Use in Food Chains, ICSEF 2018, 17 Oct 2018 - 19 Oct 2018, Cyprus, Pahpos. Hadawey, A and Hasan, A and Al-Wahaibi, Y and Abdul-Karem, W and Al-Raheem, KF Theoretical and experimental study of bubbly gas-water two phase flows through a Universal Venturi Tube (UVT). International Journal of Information Science and Engineering, 2. 43-58. Hadawey, A and Jaber, T and Abdul Ghaffar, W and Hasan, A Air Curtain Design Optimization of Refrigerated Vertical Display Cabinet using CFD. International Journal of Engineering, Science and Technology, Volume. Hadawey, A and Tassou, S and DA Silva, D Experimental Study of a Light Commercial Refrigeration System Operating Under Frosting Conditions. In: The 23rd IIR International Congress of Refrigeration, 21 Aug 2011 - 26 Aug 2011, Prague, the Czech Republic. Hadawey, A and Tassou, S and Ge, YT Liquid Pressure Amplification in Refrigeration Systems – Potential for Reducing Energy Consumption in Retrofit Applications. In: SEEP 2010 Conference Proceedings, 29 Jun 2010 - 2 Jul 2010, Bari, Italy. Hadawey, A and Tassou, S and Ge, YT Energy Savings through Liquid Pressure Amplification in Refrigeration Systems. In: Sustainable Refrigeration and Heat Pump Technology Conference, 14 Jun 2010 - 18 Jun 2010, Stockholm, Sweden. Hadawey, A and Tassou, S and Suamir, IN and Marriott, D Integration of CO2 refrigeration and tri-generation systems for supermarket Applications. In: 1st IIR International Cold Chain Conference, 29 Mar 2010 - 31 Mar 2010, UK, Cambridge. Hadawey, A and Tassou, S and Jouhara, H and Suamir, IN Performance optimization of a secondary refrigerant display cabinet using tests and CFD modelling. In: 1st IIR International Cold Chain Conference, 29 Mar 2010 - 31 Mar 2010, Cambridge, UK. Hadawey, A and Tassou, S and Suamir, IN and Chaer, I and Marriott, D Investigation of the performance characteristics of an ammonia-water absorption chiller in a tri-generation system arrangement. In: 5th Heat Powered Cycles Conference, 7 Sep 2009 - 9 Nov 2009, Berlin, Germany.